•	1 cup of fine semolina. •	1 cup of cow yoghurt. •	An envelope of baking powder yeast. •	1 cup of water. •	1/4 a spoon of lemon juice. •	Mix flour with semolina, yeast and sugar, then add yoghurt and water and mix well, then leave the mix to brew for 30 minutes. 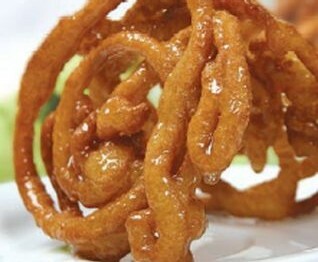 •	Pour the mix in the pastry's bag that have a metal head and pour it in the hot oil like spiral circles. •	After frying immediately, immerse it with syrup and get it quickly.